DEFECTIVE CONDITION AS PER SCAN ON BOTH SIDES. BRITISH ROYALTY 1910s King George V & Queen Mary. Patriotic Flags. Any price markings you may see on the item (in pencil, pen, sticker etc) are not valid. He was the second son ofAlbert Edward, Prince of Wales (later King Edward VII), and grandson of the then reigning British monarch,Queen Victoria. 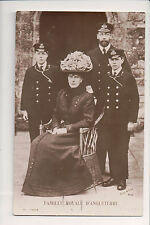 From 1877 to 1891, George served in theRoyal Navy, until the unexpected death of his elder brother in early 1892 put him directly in line for the throne. She married on 25 April 1867 inBerlin withPrince Philippe, Count of Flanders, second son of KingLeopold I of Belgium andLouise-Marie of Orléans. Her full style and title wasHer Royal Highness Marie, Princess Philippe of Belgium, Countess of Flanders, Princess of Saxe-Coburg and Gotha, Duchess in Saxony. Showing Prince Boris, with printed autograph. Much later on behind. Nikola I. Petrović-Njegoš. andspecial promotions ! Shy but smitten, Prince Albert proposed marriage to Paola, and she accepted. On 2 July 1959 he marriedDonna Paola Ruffo di Calabria (born 11 September 1937) inBrussels. She is the daughter ofFulco VIII, Prince Ruffo di Calabria, 6th Duke of Guardia Lombarda and his wife, Countess Luisa Gazelli di Rossana e di Sebastiano (1896–1989). Luitpold Maximilian Ludwig Karl of Bavaria. May 8, 1901 August 27, 1914 died in childhood frompolio. Very Good (VG)- No visible creases, no tears, no rounded corners. Occasional mark/grubbiness to reverse or odd corner showing signs of handling. Very Collectable ! Excellent (EX)- Bright, crisp, crease free with sharp edges and corners. Grand Duchesses Olga and Tatyana Romanovs as nurses. 1916. Printed by Gustav Liersch & Co., Berlin. For up to 100 grms. Augusta Victoria of Schleswig-Holstein (Auguste Viktoria Friederike Luise Feodora Jenny; 22 October 1858 – 11 April 1921) was the lastGerman empress and queen ofPrussia as the first wife ofWilhelm II, German Emperor. KING EDWARD VII & QUEEN ALEXANDRA. UNUSED --EDGE WEAR & CORNER DINGS. Unused Bulgarian Red Cross issuance charity stamp for help of Korea during the Korea-US war. Left: Bulgarian Red Cross. Down: Help of 20 Leva for the Korean people. Right: Hand down of Korea. In very good condition.